We have been holding on to this recipe for a little while now, but just had to share it with you. If you love easy make-ahead recipes, this one’s for you. Recipes that are easy to throw together in the morning when the kids are running around like crazy and you’re trying to get everyone out the door are a lifesaver! Trust me, we know firsthand how important it is to give the kids a quality breakfast before they head out the door. Last year we made a Make-Ahead Waffle Mix that the kids just gobbled up. That being said, the kids are getting pretty good about fixing breakfast for themselves lately. It’s still important to make time to fix a nice breakfast for them at least a couple times a week. This is one recipe that won’t take much time at all to throw together. This Make-Ahead Pancake Mix is SO easy to throw together, and making multiple batches is a breeze, especially if you have a handful of Mason jars on hand. Simply combine all the dry ingredients in the jar, and the pancake mix is ready to go the next time you want to make the best pancakes. 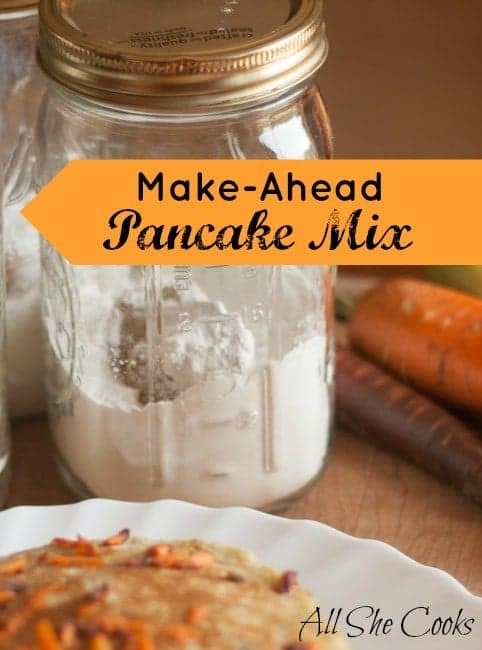 You can use this mix to make pumpkin, carrot, banana, and apple pancakes. I guest-posted a couple times recently using this Make-Ahead Pancake mix. 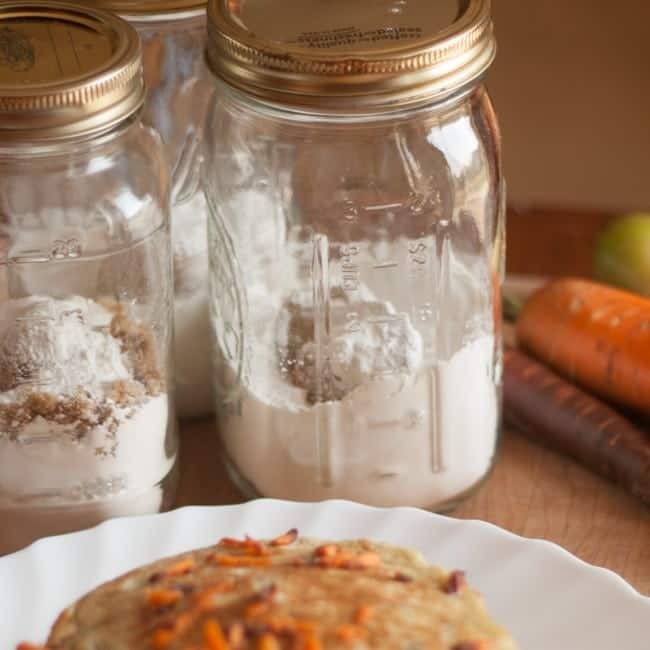 Check out my recipes for Hearty Pumpkin Pancakes and Carrot Pancakes. Getting kids ready for school and out the door on time isn’t easy. And I can imagine that an easy breakfast meal would be just as important if you have a toddler running around and want to get breakfast on the table without pulling your hair out. You can throw these pancakes together in under ten minutes, and give your kids a hearty meal that they will love. What’s your favorite quick and easy breakfast? We’d love to hear your ideas for rushed morning solutions! Recipe is per recipe. Add all ingredients to a jar or Ziploc bag. 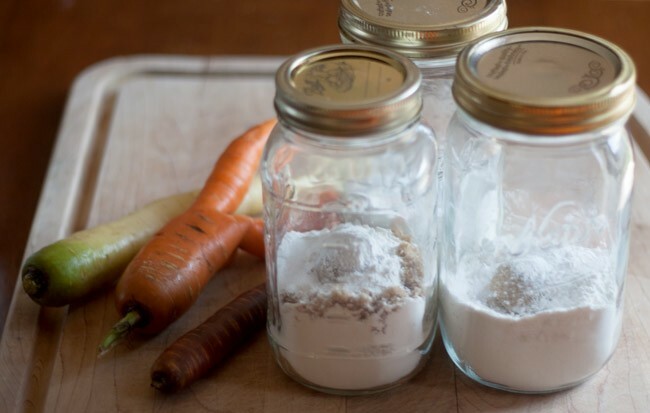 Make as many jars or bags full as you will use up within a couple of weeks. When ready to make pancakes, mix together with 1 egg, 3/4 cup milk, 2 tablespoons vegetable oil, and 3/4 cup of a mix in such as pumpkin, applesauce, mashed bananas, or shredded carrots. Add a couple tablespoons of additional milk if needed. « 52 Weeks of No-Repeat Meal Plans- Week #24! my family loves pancakes and I usually only make them on the weekends when I have time. The mornings during the week are too crazy! Now, I can whip up this recipe in no time! No more cereal before breakfast! Hi Sami! I hope you enjoy the pancakes. You’ll have to let me know which wet ingredients you use to make them. I had mushy bananas last week and totally forgot to make them up into so easy peasy pancakes. That’s way easier than I thought it would be! And probably way cheaper than the premade mixes at the store. I can’t seem to find the actual recipe. Am I on the right page? The recipe is there now. I’m not sure why it wasn’t showing up before. Thanks!